Speakers for the iPod come in all shapes and sizes. 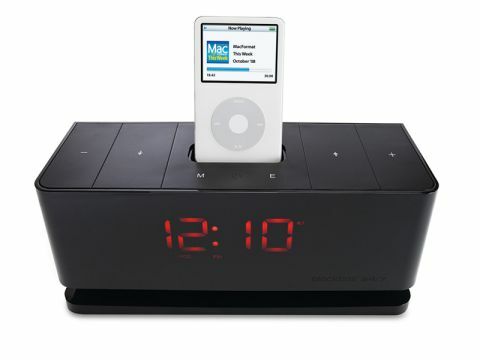 One popular format is the iPod clock radio. We have seen these at all price points up to £500. This BlackBox 24/7 is at the other end of the scale and will appeal to people on a budget with little need for higher features like DAB radio, and CD players. It offers a basic, no-frills setup at a decent price. Gear4 has raised its game in recent times. We particularly like its recent Duo speaker system. Its products seem better built than before and the BlackBox 24/7 is another good box. It's an elegant, slim format that takes up next to no space on a bedside table or shelf, and has big, bright numbers showing you the time, or FM frequency. The iPod dock is good quality and comes with a rack of trays and support for nearly all iPods (see iPod compatibility in specs). Our one grumble would be the lack of iPhone compatibility, as there is no GSM shielding. At a push, you can drop an iPhone into the iPod touch tray and switch off the iPhone's phone (Airplane Mode) if you want. Tuning to a radio station is easy. We didn't need the manual. Fine-tuning is tricky as there is no 0.01 KHz increment on the dial, only 0.5KHz. This might become an issue in areas where the radio spectrum is crowded. A remote comes in the box and it will scroll through the iPod's menus, though the tracks are not displayed on the front-facing LED panel. On top are five large buttons, which are perfectly sized for slapping with a poorly aimed hand in the wee hours of the morning. The sound quality is fine for the money, and reflex bass ports add enough low-end to give some weight to the sound, but don't expect too much from it. There is a 2x AA battery option, but this is for power-out to keep the clock correct, rather than to offer a portable radio solution.